Peas can germinate at temperatures as low as 39 degrees Fahrenheit (4 degrees Celsius), which makes them an excellent starting point. Growing peas for shoots is an easy way to get a fresh hit of flavour within just a few weeks. Pea shoots taste just like peas and are packed full of nutrients. Other early-rising salads include Oriental leaves such as mizuna and mustard, coriander, corn salad (also known as lamb’s lettuce or mâche), and the fleshy leaves of winter purslane (miner’s lettuce). Hardy varieties of spring onions can be sown directly into fertile, well-drained soil. Sow seeds thinly in rows 6in (15cm) apart. 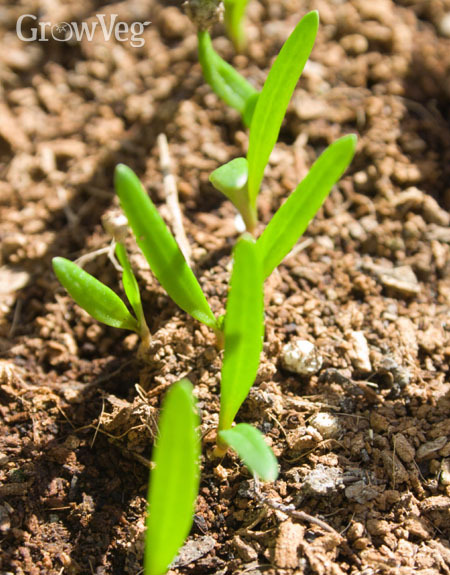 The seedlings shouldn’t need thinning out if they are sown thinly enough. You can also sow three seeds per module to plant out at 3in (7cm) apart in both directions. Place covers over your spring onions to help them along. Depending on your local climate and weather, the first stems will be ready by mid spring, when most gardeners will only just be starting to think about getting them underway. Young plants raised in pots or modules will need acclimatising to colder temperatures before they are planted outdoors. Cold frames can make a handy halfway house. Lift off the lids during the day then replace at night. Do this over the course of a week to ready them for planting.